Editor note: this interview took place on August 16, Steve is currently en route to Byron Bay; and some readers may find the following content distressing. Australian legendary gospel-rock and country singer-songwriter Steve Grace is currently adventuring across Australia for a world first. From Shark Bay to Byron Bay, Steve is travelling from west to east on his Harley Davidson alongside his wife Kerrie and his three sons. The Crossing Australia project is more than just travelling across our country the hard way but it aims to bring communities together to fight suicide and depression, an issue very close to the Grace family. Before Steve and his crew embarked on their adventure from the west coast in August, Steve caught up with 98five’s Brekky with Kirste and Morro to share his heart behind Crossing Australia. Kirste: You love your motorbikes. Let us know all the details because I don’t personally ride motorbikes but I’m sure there’s a lot of people out there that are rev-heads. Steve: I grew up in Papua New Guinea, Mum and Dad were missionaries up there and Dad had an old 650 BSA Goldenflash and the whole family travelled on that. Mum and Dad and the three kids! So I’ve grown up with motorbikes and I absolutely love Harley Davidson motorcycles. Nobody has ever ridden a Harley from the western most point of Australia, up at Shark Bay Steep Point across the Great Victoria Desert, across the western desert, across the Simpson, across the Strzelecki and Stony Desert all the way across to Byron Bay. So I’m going to have a crack at it! Morro: No one’s done it so someone has to right? Is that what you thought? Steve: When I knocked on the door of Harley Davidson at home they just said ‘we don’t want to support this because we don’t build our bikes for this.’ I thought that’s not really true because my dad had an old Harley and back in those days all the roads were dirt. And they were built for the war. Anyway, I’m trying to convince Harley Davidson to get on board with me but you know what? We’re going to do it anyway! I reckon this is bigger than the Olympics. I reckon it’s bigger than Ben-Hur. I actually reckon this is bigger than an Eagles and Dockers grand final. Morro: That’s a big call! 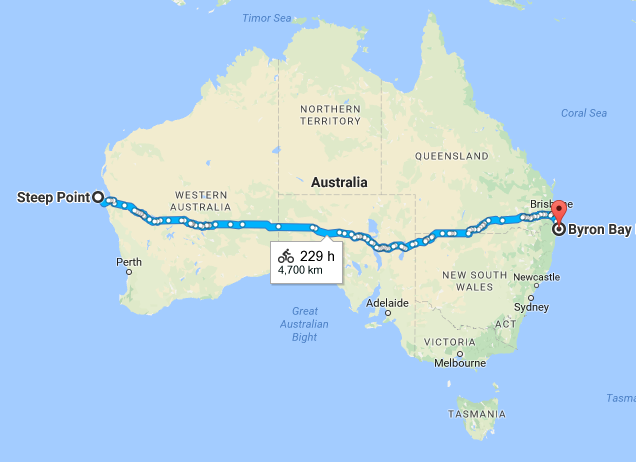 Tell us, they do call it the paddock and you obviously thought ‘let’s ride across the paddock’ but where did you come up with this idea of Crossing Australia and what’s the ride for? Steve: It actually goes far deeper than just riding a motorcycle. 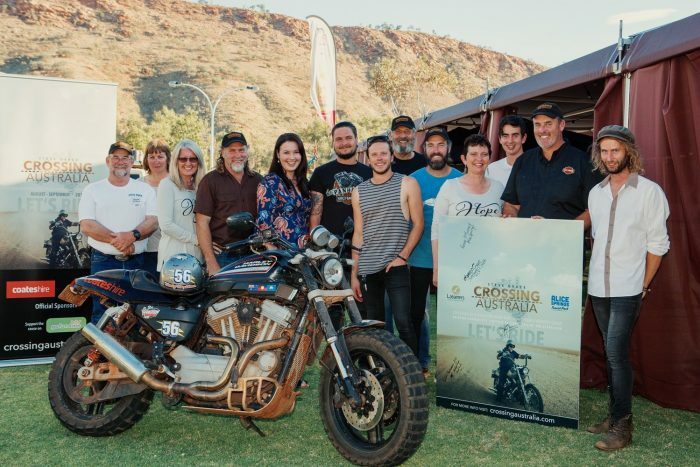 The ride is all about depression and suicide prevention in isolated regions across Australia. The suicide rate is not slowing down here in this country. It’s the biggest killer in our country, bigger than car fatalities. And especially with young men from ages 16 through to 44, it’s the biggest killer of men in Australia. It’s been all over the news lately but it’s when you come face-to-face with it, Morro — for Kerrie and I and our three boys, our middle son Ryan went through a very, very dark time about four years ago and attempted to take his life. That changed everything for us. I mean, here I am, Steve Grace, country-gospel singer travelling around the world telling people the good news and one of my own boys is going through the darkest time. I was actually at a Better Blokes conference over in a little place called Murrumbateman near Yass in NSW and I got this phone call. It’s a phone call that changed my life — ‘Steve, you better come home, your son just tried to hang himself’. I had no idea just how bad things had got for Ryan. Look, it’s an amazing miracle story that Ryan is a suicide survivor and he’s coming on the Crossing Australia trip. Not only to ride Harleys with his dad but to share his story. Back in March, we did a tour in Victoria and I was just blown away with the line-up of people who wanted to talk to Ryan at the end of the night because here’s a young man that has made a few mistakes, been angry at life and angry at God and just came to the end of himself and yet God has rescued him. I’m very grateful for that. Morro: That is awesome. Steve, it is such an issue across Australia and we want to really encourage people to support you. You can follow Steve Grace Crossing Australia at www.crossingaustralia.com. Listen to Brekky with Kirste and Morro every weekday from 6am. This article features in The Advocate‘s monthly online and printed newspaper.